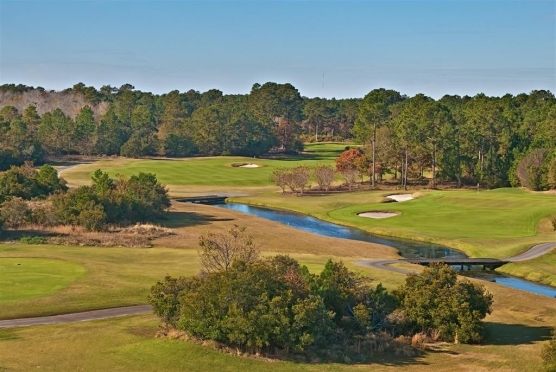 CONWAY, SC - Many golf courses state that they harmoniously blend Mother Nature and their course layout. Actually, many architects do take advantage of the local terrain to carry out their design. However, few golf courses can match this Dan Maples gem for combining pure natural beauty and outstanding playability. This Par 71 winds its way through acres of tranquil lowcountry wetlands with an abundance of forest, native plants and animals. More than 4,000 feet of bridges cross the wetlands and connect the course. Located in a populous Conway/Myrtle Beach corridor, The Witch remains untouched by development. With five Par 3s The Witch is not painfully long. The Black Tees play at 6702 yards and a slope/rating of 133/71.2. White Tees are 6011 yards at 121/68.3. The Orange Tees are 4812 yards at 109/69. It’s easy to be overcome by the beauty and tranquility of the course. Enjoy your time on this track. The Witch was in tremendous condition with over-seed on tees, fairways, greens and both cuts of rough. Although the generous greens are Bermuda grass, they putted much like bentgrass. Roll a few before playing. There are no parallel sight holes on The Witch. Wide patches of forest separate the holes. Each hole is strikingly different. It’s a course you do not want to finish playing for fear you might miss the next dramatic hole! The Witch is a very lady friendly course. Allow time for a visit to the pro shop. The Witch logo is a unique and popular brand. Although not particularly long each of the five Par 3s offer something different. Collectively, they present an excellent opportunity to score well. Even with a 40-yard difference between the Black and White tees on Hole 3, both level of golfer has an opportunity for Par or better. Pay close attention to the pin position and yardage. On the back Hole 17 with its extreme drop has an intimidating look. Again, choose your club wisely and take a confident swing. A timid swing will leave you in the sand trap that protects the front of the green. The Par 4s at The Witch do have some length. Whenever a Par 71 course has 5-Par 3s, there’s a little extra yardage in the Par 4s and 5s. Of the nine Par 4s, four exceed 390-yards from the White Tees. Holes 1 and 2 test your mettle right from the start. Both holes demand an accurate drive to the center of the fairway. Hole 2 brings water into play for an errant second shot. Even a strong approach needs to avoid the sand bunkers protecting the green. Hole 9 is a stunning finish to the front nine that demands absolute accuracy with your drive. Take your drive straight at the 150-yard marker and about 20-yards past. Hole 18 is spectacular as it brings you back to the clubhouse. The approach shot from the elevated fairway to a well-trapped green is a challenging golf shot. Bring you’re A-game to The Witch Par 5s. Each exceeds 500-yards and to the average golfer they are all 3-shot holes. Hole 5 is a rare double dogleg that requires distance and accuracy. From the Tee a fairway trap protects the right side. Even clearing the trap may very well leave you in the rough. Play safe up the right side of the fairway. It’s your second shot that will demand the most of you. It’s 190-yards from that fairway trap to clear the dogleg left. Execute well and you’ll have a short iron to the green. At 544-yards (White Tees) the No. 2 handicap Hole11 is straight away. Make solid contact and go up the center of the fairway. A good approach shot to the pin is very important as this green has some undulation. As a golf course reviewer, I can always find something to like at every golf course I play. However, it’s rare when I cannot find something to dislike. The Witch is one of those rarities. You can certainly play more expensive golf courses, but this is one you definitely need to schedule. It’s a value at any price. Personally, I cannot imagine a better day than experiencing The Witch with friends.